Choose 1 of your opponent’s Pokémon. Remove any number of damage counters from that Pokémon, then draw that many cards. Flip a coin. If heads, the Defending Pokémon can’t retreat during your opponent’s next turn. I am now scarred for life. 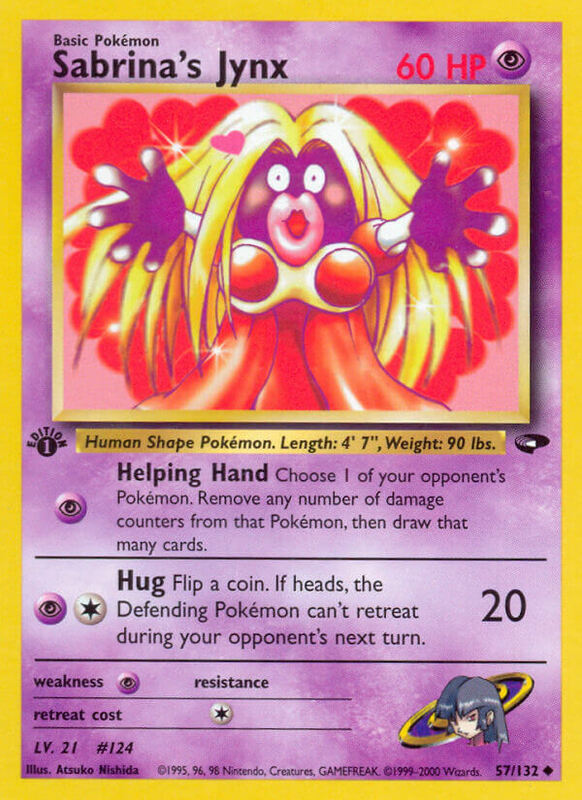 Helping Hand has to be one of the most dangerous moves in the entire TCG, and it’s a (P) attack on a basic for heaven’s sake. I don’t understand what you mean at all. You could theoretically draw 15 cards out of that attack alone, against EXes. Its actually quite the conundrum. You have a Pokemon with massive HP on the brink of being KO’d. Do you take the KO, or risk having to redo all of that in exchange for drawing a stupidly high amount of cards. Should you chose the latter, you still risk getting hit with an N, Rocket’s Admin, Judge, Desert Shaman, Red Card, Impostor Oak or whatever. I’d take the KO. Why would you need That many cards…next turn? Just use a Colress or reliable old Claydol to draw during your turn and attack with a good Pokemon. You really don’t. But should you decide that you do, there’s always some hand disruption lurking in whatever format you’re playing this in. That, and allowing your turn to end is tantamount to yielding in vanilla unlimited. This one is obviously not going to be dominating any matches, but it’s a lot more interesting than its classic-age pokemon power-less brethren. AND THE GRAND FINALE! NO CARD IS SCARIER THAN THIS!